We bought our UPPAbaby G-LUXE stroller when B was just over a year old. While we loved his Bugaboo Bee, it was far to heavy and cumbersome for airline travel and we were looking for something more compact for an upcoming trip to Hawaii. The G-LUXE turned out to be so convenient, we never bothered to use our other stroller again. Not only is it the perfect travel stroller, it is a great choice for everyday use. It is durable and reliable - Our G-LUXE has been gate-checked on over two dozen flights, bounced over miles and miles of cobblestones, been folded up and unfolded hundreds of times and it works as well today as the first day we had it. Over the last two years, it has taken a real beating and it still keeps going! Easy to clean - The fabric is easy to wipe clean and the latest model has a removable cover that can go in the washing machine. We help it continues to stay clean by using an airport gate check bag when flying. Lightweight - According to the manufacturer, it is the lightest reclinable full-size umbrella stroller available in the U.S. At only 11 lbs, it is easy to tote about when not in use with the convenient shoulder strap. 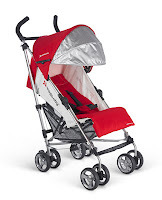 Do you have a favorite travel stroller?